The strip is one of the most fashionable patterns in women’s clothing, and its relevance has remained unchanged for decades. She did a lot to popularize striped prints and legendary Coco Chanel. Since then, designers and stylists have come up with a lot of women’s outfits and combined images with a striped pattern. What is it possible and fashionable to wear striped clothes in 2019? Pinstripe (material in a thin, barely noticeable strip on a neutral background). In addition, there is a division in thickness and other characteristics. In particular, they distinguish hair (very thin), pin-outs (1-2 threads wide), pencil (with a predominance of light background), candy (bright, 3-4 mm wide), Bengal or tiger (6-7 mm wide, along with with a background shade), awning (more than 7 mm wide, dark on a light background), “barcode” stripes (two or more shades of different thickness, located close to each other). Also known are the Bayadere stripes (bright and colored, of different thicknesses with a predominance of fiery tones), shadow stripes (a stripe of muted tint goes along the bright strip, creating a shadow effect) and many other types. 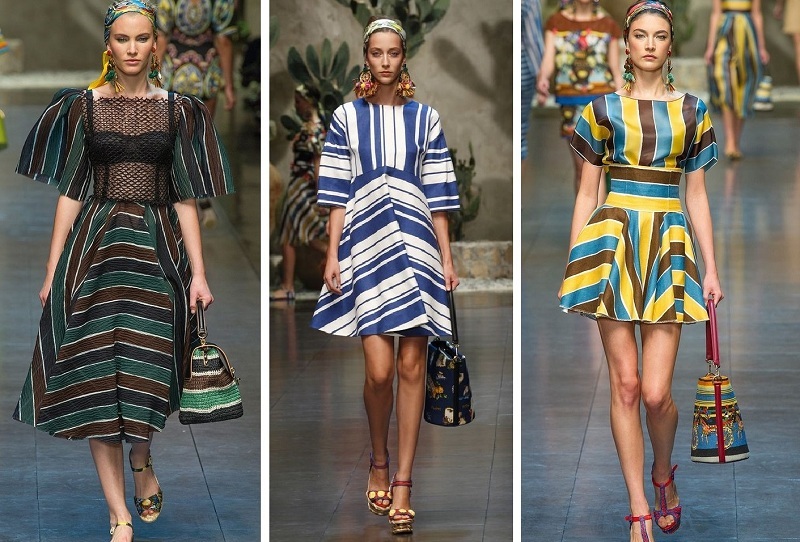 By orientation, the stripes are divided into vertical, horizontal and diagonal, there are also combined prints, indistinct stripes, individual images, embroidery, appliqués arranged in stripes, two-color and multi-color drawings. All this diversity is actively used by designers who create new trends or recreate elegant retro images in women’s clothing. It is well known that horizontal stripes on clothes visually give volume and reduce growth, while vertical stripes, on the contrary, slim and make it taller. However, this is not entirely true. For example, narrow and poorly pronounced horizontal stripes will not give you additional volume, and wide vertical ones are recommended for thin ones because they visually increase in size. 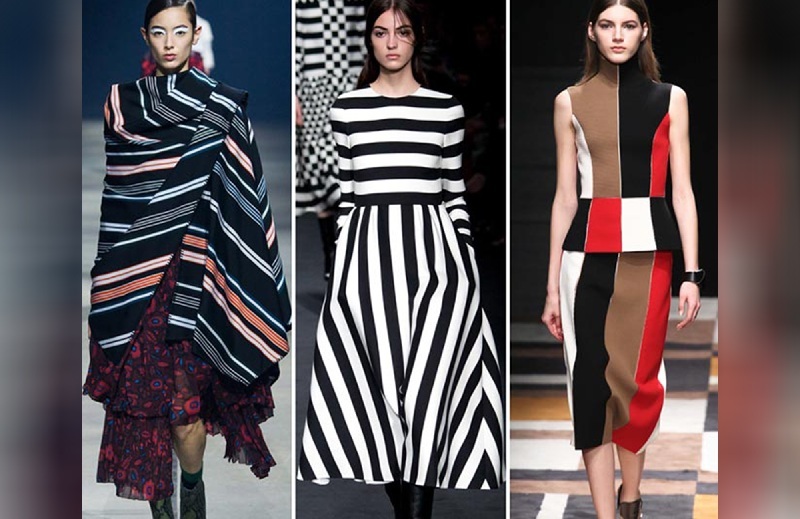 Proper use of vertical and horizontal stripes in different items of women’s wardrobe allows you to adjust the shape, adding pomp to where needed (wide horizontal stripes in the bust, hips), and reducing, if necessary, extra centimeters (the narrow, vertical strip in the waist). Holders of figures with narrow, sloping shoulders and wide hips should prefer skirts in a vertical narrow strip and blouses in a wide horizontal one. 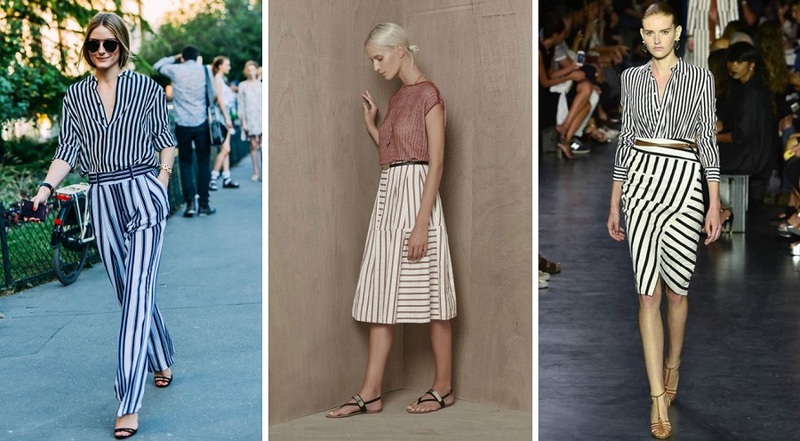 Women with narrow hips, on the contrary, it is better to choose a fluffy skirt with wide horizontal stripes. The diagonal strip also slims, adds height, helps balance the silhouette. Stylists recommend wearing striped clothes, confirming not only with the features of the figure but also to the trends of 2019. However, not all girls are ready for experiments inspired by the transient fashion. 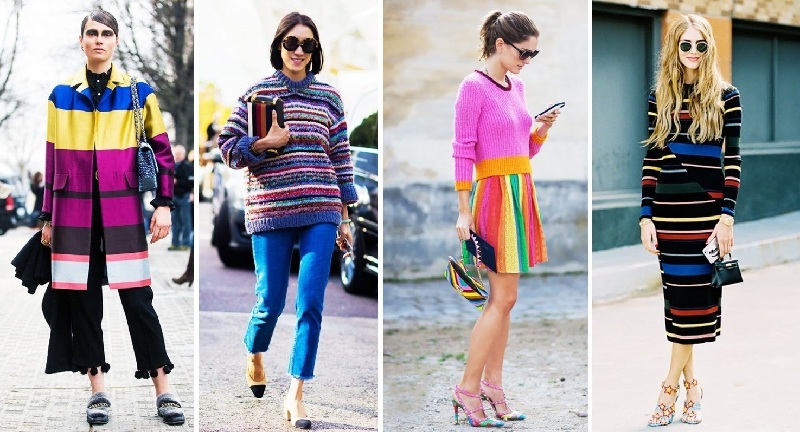 In this case, you should pay attention to the classic combinations that always look stylish, but not pretentious. The strip is a universal print that can play diametrically opposed roles. So, in a bright, colorful image, he will perform a neutralizing function; will bring a touch of rigor. If you add a striped accessory to a strict or neutral alongside – a handbag, shoes, a hat, a scarf, the image will immediately become less formal and a little naughty. 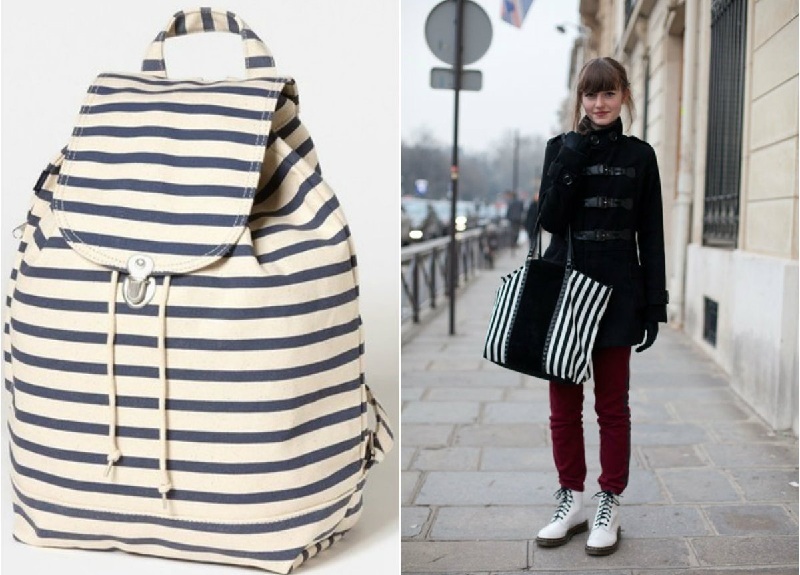 For example, a striped backpack in combination with a blouse, skirt, and cardigan, sneakers or black shoes with laces will make the office bow relaxed. Striped garments are perfectly combined with monophonic things, even if they are designed in different colors. For example, white, blue, deep, as well as pink, red and yellow dresses, blouses of the same shades and neutral trousers (dark or light skirts) will make friends with a blue jacket with white stripes. 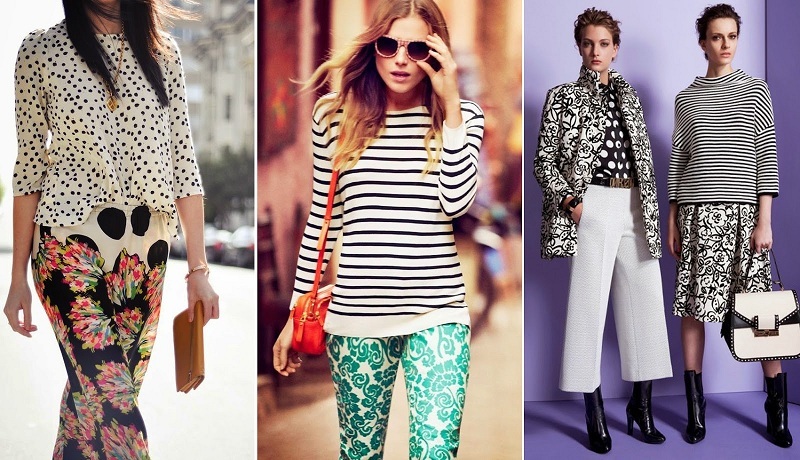 The classical rule of the ideal combination of one large garment with a print with monochrome products also applies to the strip. Anyone who is conservative in clothing is recommended to use time-tested combinations: a striped skirt and a monochromatic blouse in the color of stripes or a related shade, a dark pencil skirt or skinny pants with a striped shirt in a marine style, a dress in a vertical or diagonal stripe with a plain raincoat, cardigan, and jacket. The tandem of a red blouse and a black-and-white skirt, blue or white trousers with a shirt in a delicate white and blue stripe looks great. With striped pants, it is worth being cautious if you don’t suffer from pajama style or excessive expression. It is better to choose neutral costume colors and experiment with the top. Striped details and denim texture of classic shades – the perfect combination. An example of this is the women’s denim jackets, which go so well with striped dresses of different colors and styles, from a sheath dress to a shirt dress. The most natural look is a tandem of blue (blue, indigo) jeans and a light striped shirt, a denim skirt and a blue and white striped blouse, a classic vest and a short denim skirt or boyfriend jeans. For those who want to play with textures, without a riot of prints and shades, we recommend considering combinations of striped trousers with a large-knit sweater or a delicate lace blouse (dress) with a striped jacket. Under color-blocking, it is commonly understood to combine in one image several things of different bright colors or of one color, but of different shades. In this case, the strip will become a kind of balancing, stabilizing element. For example, you can choose a bright red jacket, a black and white striped blouse, and black or white pants. Similarly, you can use clothes with colored stripes (colored dress with vertical pink and purple stripes, a purple jacket, and pink or red sandals), as in the photo. Instead of a common, identical for different color prints, you can use two shades, adjacent to the color wheel or directly opposite. The combination of a floral print with a strip has already become a classic. The most common combinations of black-and-white or blue-and-white vests with colorful skirts, but the range of possible images is not limited. 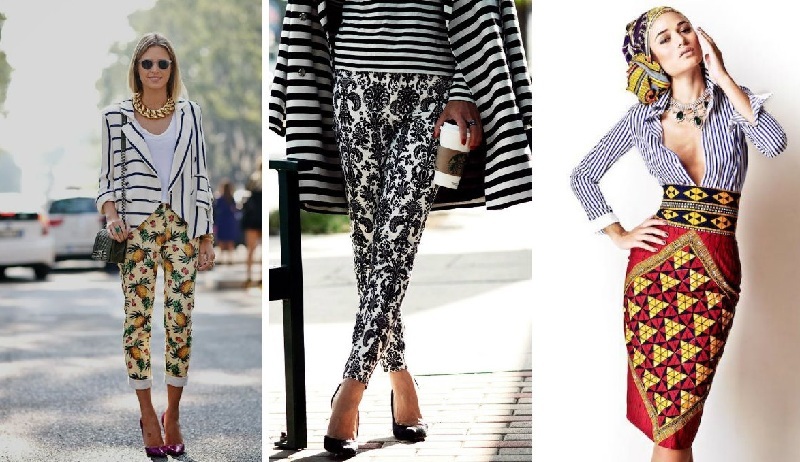 Given the above recommendations, you can successfully combine trousers with floral patterns and a striped blouse and vice versa. Beautiful and catchy look women’s dresses in a flower with trench coats and striped jackets, even striped overalls in tandem with floral blouses and T-shirts have the right to life if only the overall colors look harmonious. On the background of a striped dress organically look a clutch in a flower and sandals, but there are also universal solutions that do not require creativity from the torments of women. Designers themselves are not averse to mixing floral embroidery or print with a striped background of summer dresses, trousers, overalls. A strip in tandem with small peas will add a romance note to the female image, and large peas will add mischief and enthusiasm. One of the classic techniques that allow you to mix a cell and a strip in one bottle implies the use of a checkered or striped accessory. For example, a mustard coat in combination with dark trousers, ankle boots, a striped sweater, and a tonal check scarf looks simply amazing, as is the combination of a checkered shirt, vest, and jeans. The strip is well combined with ethnic and traditional prints in similar colors (black and white, yellow and blue, blue and white). So, a striped shirt, skirt or pants look great with a piece of clothing made of fabric with a Moroccan print, ikat, paisley patterns. A striped skirt and a white blouse will get along with shoes with a leopard pattern, a bag of crocodile skin. You can wear striped clothes with other striped things, as long as the prints are different in size, direction and, possibly, shades. Looks great combination of a black and white skirt with a wide strip and t-shirts of the same colors, but with a narrow strip. At the same time accessories can be bright, but monophonic and not numerous: a red handbag and shoes, silver beads and sandals, a black clutch. The black and white strip with colored striped things, balanced by neutral shoes and a handbag, also looks good. Choose your type of strips in clothes (or several striped things at once) and combine them at your pleasure, creating new images and being inspired by our selection of photos!